No really, I am - which is why this is the first post of 2019 even though it's March. Am in the depths of assignments for my course at work, this is number five of six, and I really hope I've passed number four, because I don't want to go back and think about finance again if I don't need to. I am also three-quarters finished with my current cross-stitch. It's a large kit, and I'm ready to have it finished now so that I can get on to the next project, which is from a magazine and has fancy typefaces and beach huts. I've also rediscovered eBay, and today the second batch of old cross-stitch magazines I've bought on eBay arrived. I've also bought a couple of current magazines recently, including one today. I can't believe it's December, and only a week until our work Christmas lunch, but there you go. As there doesn't seem to be a way to view all your contributions in one place (only your reviews, I don't think they've changed this since the site began 20+ years ago) I thought I'd do it here instead. 1.) Look up ten of your favorite films/TV shows on IMDB. 2.) Go to "trivia" and pick out the most interesting fact about each film. So Christmas Day was good, as I'd expected it probably would be, but the rest of the holiday was kind of dull. The weather precluded any spontaneous visits anywhere and as the office is shut there was nothing to do but stay in. It was good to get back to work and the usual routine. However I managed two weeks back at work and then I was off all of last week with flu. I'm still not 100% yet, even though I was back at work today (I'd have needed a doctor's note for any more time off). I'm mostly functioning but I don't have all my sense of smell & taste back - I can't taste coffee or chocolate biscuits which isn't good. I spent the first few days in bed, getting up for a shower and fresh pyjamas before heading back to bed. I finally managed to get up and dressed in proper clothes on Thursday, and I managed some toast and orange juice. I've been building up since, and am still getting there, it might be a few more days yet - the last of the Christmas chocolate biscuits remain in the tin because I can't taste them. I'm trying to look forward because I don't like January and it's only a few weeks until the Winter Olympics. Not sure if we're going to come away with much (Lizzy Yarnold's prospects of defending her Olympic title are wavering) but I'm determined to enjoy the Olympics. Then there's the Paralympics in March and then the Commonwealth Games in April so plenty to enjoy before the summer. 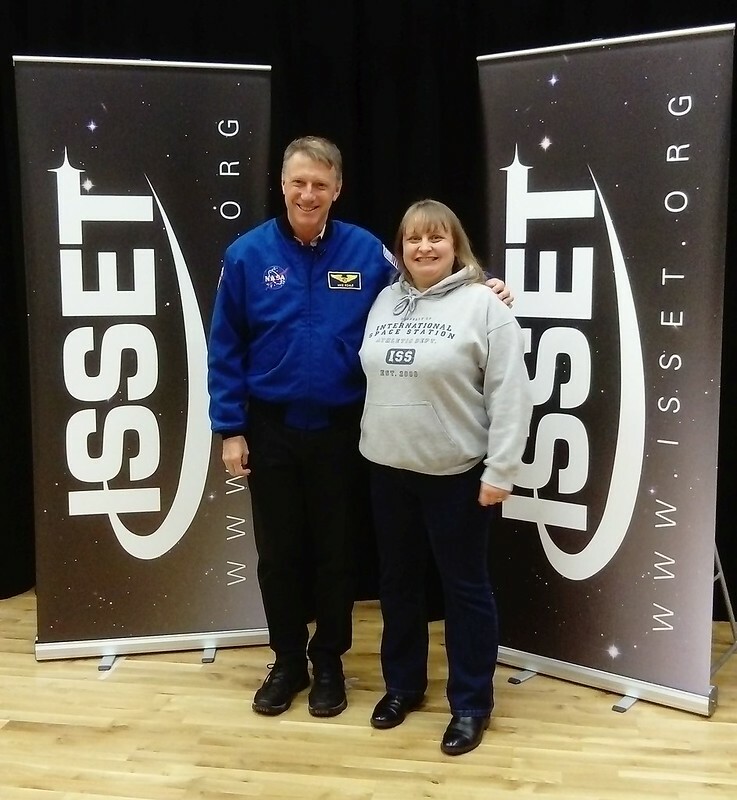 I met another astronaut last night! There was an event at my old school, and my friend (whose sons currently attend the school) had emailed me about it. Michael Foale is a retired NASA astronaut who grew up in Britain with joint US/UK citizenship who defied his university friend Stephen Fry's assessment of his ambition as "potty" to move to the USA after his PhD and work for NASA, serving on six spaceflight missions with the astronaut corps, including long-duration stays on both Mir and the ISS and a repair & service mission to Hubble. I was a bit disappointed that no-one else there was wearing space clothing - there were Scouts, and I think Air Cadets, in uniform, and a mix of other people young and old. But the talk was very interesting, it focused on his Mir mission and how he saved the space station when a Progress cargo ship crashed into it. I knew the basics about the story but it was interesting to hear more background to it, and detail he told and showed to us from the event - I wasn't aware there was footage of the crash (from the computers) until he played some to us. There were lots of questions at the end, the first being from the smallest girl there who asked if he'd seen any aliens during his time in space. It was my first time back at my old school since I was a student there (1984-1991) and I knew all about the building work that's been going on recently - basically the whole place is being rebuilt, as far as I understand. In order to keep a functional school operating they've built the new buildings on what was the vast playing fields and outdoor sports areas, while the old buildings are still in place but cordoned off awaiting demolition. The same service road is in place, just the end is different as it turns into a pedestrianised area in front of the new building. It's possibly the first time I've been there at night, and definitely the first time I've driven there. Walking round the service road from the car park, past the cordoned-off but very recognisable old buildings was quite bizarre and rather Doctor Who-like, as if I should've brought a sonic screwdriver with me. Also, the heating and ventilation system in the new school building worked as intended, which was a rare thing in my day. As I'm on leave this week, I'd better get on with more of the things I said I'd do when I had some time off work. Yesterday I went into town and bought a bundle of Christmas things, while planning others (some items I can't get until near the time). Anyway the big thing I'm succeeding with this year in particular is my reading. I'm on course to finish my sixth classic novel by the end of the year. I have also read two novellas and six Shakespeare plays this year, and this post is a bit of an exploration of all the Shakespeare I've read so far. I plan to post more about my other recent reads, but probably not about 2017's six novels until I've finished them all. More about the novellas and previous novels another time though. Earlier today I bit the bullet and deleted my LJ. I'd got everything backed up, and had tested a few communities and found I can still access icon creation journals without an LJ. Now I'm here on DW and have changed my layout design, but can't help feeling they're a bit meh compared to some of the really nice ones they had on LJ. I think this one is quite summery and very different from my previous layout, so hopefully I can keep this for a while and from all the new people coming to DW there will be someone who's a whizz at creating lovely layouts. In other news I have watched The Night Manager all the way through twice since last weekend and would now like to watch Rev again, which I haven't seen for ages. And happy to report that Thomas Pesquet has landed safely back to Earth, meaning all the ESA class of 2009 (the Shenanigans) have now completed their first space missions. It's a whole week since this happened and I still can't get over how awesome it was. Last week, bmax67 and her family vacationed in the UK and on Thursday I travelled down to London to meet them! Despite having achy knees that evening and the next day from walking all round the museum and then standing up on the train, it did not take the shine off the day. It was so great to meet bmax67 after knowing her online for so long - first at the Devoted to Hugh fan forum, then here, and now also on social media. It's a whole month (ish) since I last posted. I have nothing new to add to the fallout from the US Presidential elections except for the fact that when I woke up on the Wednesday morning it was from a dream that Hillary Clinton had won and was giving a press conference, accompanied by Chelsea, from a hotel's rose garden. In the UK us sensible chaps have been cheering on the various legal and parliamentary attempts to prevent the triggering of Article 50. I had my first mince pie of the season today at work, and am part-way through Christmas shopping. I'm waiting to hear what my sister and her partner would like - Mum reckons they'll ask for giftcards or vouchers. It's four weeks until our Christmas lunch at work, too, which I'm looking forward to but am sad that one workfriend will be unable to join us. I am continuing my cross-stitching in fits and starts. Wednesday evening's session was the first for a couple of weeks and at one point I used the wrong shade of dark green, but hopefully I've countered that by using another moderately dark green in another place. Last week my long-anticipated copy of A Month In The Country arrived - I have it on the original issue DVD, but this is a much better quality picture and has audio commentary and a few interviews, including one with Colin Firth, as extras. It's a double-disc set that contains a DVD and a Blu-Ray disc and I cannot recommend it highly enough. I went into town today, as we have always said. In other words, I went into the city centre to do some Christmas shopping. I went on the bus, having originally planned this so I'd be out of the way while my road is closed for resurfacing. However, that's been delayed until Monday so I'll have to leave early for work. I managed to get the things I wanted - Christmas cards, an advent calendar, a 2017 diary - plus a few other bargains from Wilko including blueberry shower gel and Vimto lipbalm. I also visited the art gallery for their Brick Wonders exhibition - basically lots of Lego recreations of famous world vistas and other things, such as our local cathedral, the International Space Station, and a massive Lego airport. Am also wondering if I've got a cold coming or if this is just the effects of the weather getting colder but not cold enough to be into a regular routine with the central heating. I've been putting it on for about an hour most evenings, and I've had the fire on a few times also. It's the beginning of half term week here now and I'm determined that winter cannot be sighted until half term is well and truly behind us. Also last night saw the first episode of QI's N series, the first edition with Sandi Toksvig in the chair instead of Stephen Fry. I do miss Stephen and I think I always will, but Sandi is awesome. I am getting used to Autumn being a thing, now that it's in full force and the trees are looking so nice. But I still miss summer, and my new must-watch The Last Leg isn't really helping here, although I plan to keep watching - I think it's on until Christmas. Am writing this part-way through my breakfast - woke up a bit later than usual and in the mood to get things done, so did my ironing, followed by handweights and then sorting the weeds along the side of the house. Remaining task for the day is to top up the queue on my Street View blog. Work is going OK I think. Am getting involved in webinars - have done my first one as housekeeper but haven't listened back to it yet, my line manager (who was the presenter) made a comment that once I've done a few I won't be rustling papers so much, so while I'm pleased to get the first one done, I'm not looking forward to listening back to it. It was a bit nerve-wracking but I enjoyed it, I need to see when I can do another. Home from shopping (having a week's holiday at home) to see we've hit triple figures in the overall medals haul in the Paralympics, and an emphatic second place still on the table. However still some difficulty in getting enough reports together to put on my Tumblr, and this is with putting only the gold medallists on - I struggled with other medallists in 2012 as they would frequently not be reported, and the same is happening this time, unless they won silver or bronze behind a British gold medallist. Am also totally loving The Last Leg, which is on much earlier this time - 8pm rather than 11pm - and I got a tweet liked by Jonnie Peacock when he was still in Rio, when I mentioned how much I liked his tutu. I'm still not sure why he was wearing a tutu but it was good. I think it's turning the Paralympics into the funkier, cooler sibling of the Olympics for me. I'm hoping it continues to air long-term, and in a decent timeslot as the next three Games are all in the same general area of the world - Beijing is the most westerly and they are eight hours ahead of GMT. 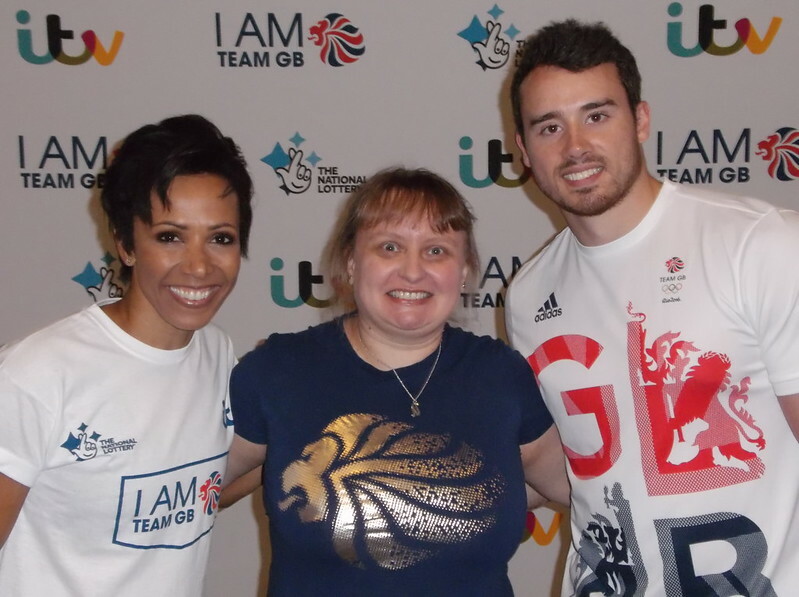 In celebration of our recent Olympic success, and in anticipation of Paralympic success, and in the hope of getting more people playing sport and getting active, today is I Am Team GB day, with events being held across the country, featuring various members of Team GB from Rio 2016 and before. I went to the one at the stadium near me, it was a good fest but there wasn't a great deal have-a-go stuff for adults - the only child-free opportunity was with the netball, which I signed up for, but they were running behind so it must have gone on without me. I did see the Team GB people arrive - Liam Heath and Jon Schofield (canoe sprint) wore their medals from Rio, and joined in stuff with the kids, such as the wall-climbing and the tennis. Kristian Thomas (gymnastics) joined in the tumbling with the kid's gymnastics club and got them all doing a Mexican wave but with a somersault instead of a wave. First time he did a tumbling sequence along the mat (somewhere between a crashmat and an inflatable mat) he overshot the end and landed on the crashmat right near me. It was also the first time I've been to the stadium, I didn't go during London 2012 (they hosted football preliminaries along with a handful of other places across the country) and I've never seen the football or rugby teams there. But it might be nice to, one day. You've seen the statistics I'm sure. 27 golds, 23 silver, 17 bronze medals. Second on the medal table, above China. First host nation ever to increase their overall medal tally in their first away Olympics after hosting. Gold medals across 15 different sports, more than any other team, and medals of any colour across 19. It still feels a bit unreal that it all went so well for Team GB, even though it went less well for some team members. Tokyo 2020 will be a real test I think, so many of the London 2012 generation who competed at Rio will be retired or will regard Tokyo as their swansong. The trick is to ensure there are plenty of new competitors to take their place, and it will be hard work, even though we're better equipped than ever to ensure these competitors come through. But I think there is a determination that we never want to see the likes of the medal tally from Atlanta again. We've had our nadir in Olympic sport, just as we had it in league football, albeit of a more unpleasant nature. Tokyo is a long way off, but we've got the Paralympics in a couple of weeks' time so all the cheering on Great Britain is really only half-way through. And we'll be hosting the World Athletics Championships in 2017 in the Olympic Stadium. Then beyond that, 2018 has the Winter Olympics, Winter Paralympics, and the Commonwealth Games. Once Rio is past, there'll be plenty to look forward to. So far it's been pretty good for Team GB at the Rio Olympics - currently 6 golds, 8 silvers, 6 bronze - 20 in all, 4th on the medal table behind USA, China, & Japan. We're at the start of velodrome coverage so hopefully that will increase. It felt a bit tentative on Tuesday, as it was mentioned that we'd had more 4th places than any other nation, but then Wednesday was a productive day. It's not easy to watch much of the time, especially in cycling - Team GB are so strong but you can never underestimate the competition, everyone else (especially Australia) would love to beat us to gold I'm sure. But it has been good to see Team GB winning new medals, we've won our first gold in diving and today our first ever medal in trampolining. One concern I can see is that there are lots of empty seats, if there are any sell-out sports they're still to come (which is understandable as the athletics only started today). During the men's road race last weekend there was a point where lots of the cyclists disappeared off to the side for a pee stop, the BBC commentator pointed out that this would never happen in the UK as there would always be far too many fans lining the route. I bought an Amazon Fire stick today so I can watch Olympics coverage late at night, as the TV in my bedroom has until now only had a DVD connected, no other broadcast receiver plugged in. It was very easy to set up. Because I wanted it quickly I went with the 30-day free trial of Amazon Prime, hoping for some good free movies to watch after the Olympics, but all I've found is Paddington and a film about Queen Victoria. It's just like back in the early 1980s when we first started renting videotapes, going into the video store hoping for a decent (or at least recent) film and finding a load of titles you've never heard of before. I've no plans to continue with a Prime subscription once the trial is up, so it'll be a one-off purchase, cheaper than a second cable box (albeit with fewer channels). I managed to stay up until almost 3am last night, to the end of the athlete's parade. I'd TiVo'd the opening ceremony but having seen highlights of what I missed I don't think I'm going to be watching it. Hazel Irvine did the same Ouagadougou joke as she did during the London 2012 opening ceremony. Have been watching some of the live coverage today - cycling, with the men's road race, which I stuck with for so long because Rio is absolutely beautiful. Much of the cycling was along a coastal road, with plenty of views of a lush blue sea, wonderful waves crashing on the beach. I'm now watching the rowing, the Serbian men's pair fell in the water but they must be rescued by now because it's the women's double sculls with Katherine Grainger and Victoria Thornley, Grainger in her fifth Olympics. So for Tim Peake's landing yesterday, there was no Stargazing Live special as so many of us had hoped. Instead, there was live coverage (mostly the NASA TV feed) on the BBC News channel, which had the usual experts (Libby Jackson from UKSA, Professor Lucie Green from UCL) along with BBC science correspondents who knew what they were talking about, and general studio presenters who didn't. So glad all went so well, there was a BBC guy who was practically interviewing Tim Peake on the Kazakh steppe. Yuri Malenchenko was sitting bolt upright early on like the seasoned space traveller he is, but Tim Kopra looked a bit wobbly for a while but he seemed to be getting his bearings OK eventually. Having this on the news rather than a dedicated programme meant the news headlines ticker was on screen almost the whole time, so all the stuff about the man who murdered the MP Jo Cox was there. I can't believe what a nightmare that was. I've met a few people through work, my age and younger, and you know immediately they're a future MP for a left-leaning party, and they'll be a very good one, just like Jo Cox. My friend and I took a little break from the usual work routine on Thursday morning to watch the Aviva Women's Tour go past along the main road near our business park. I had read about this early in the year, and my friend wanted a photo to illustrate a staff newsletter article she was writing about the Cycle To Work scheme. I took my flag and was cheering and yelling as they went past - it was still quite early in the race so they were all in a big bunch. Sadly we didn't get on the TV highlights, they went straight from the start in Atherstone to the part just after us when they went through the University of Warwick campus. But it was so exciting seeing all the build-up, the police motorbikes, the race marshal motorbikes, and the support cars going past, all waving at us, and us waving back. There wasn't many of us along that stretch of road, but there was lots of TV coverage of other stretches of road where there were lots of schoolkids cheering and waving flags. I was only going to watch the highlights once but I'm going to keep them now, as there are lots of sights I recognise, and I'll always remember being out there, even if it was only for a short time. Yes, I am still here, although I am more frequently found on the Wii Fit these days. And I'm still using Facebook like a proper Facebooky person. But as my last post was about Tim Peake and he's now more than halfway through his mission, I thought I'd better get back on here again so that the post on his EVA wouldn't then be directly followed by an end-of-mission post. Have also been enjoying The Night Manager, even though I doubt I'd have tuned in if Hugh Laurie wasn't in it. Spy dramas, no matter how brilliantly done, aren't my thing. But it's so good to see Hugh playing a properly evil baddie. And Olivia Coleman is awesome as always. It's been Stargazing Live week, and it's been the best one yet. We had an extra show tonight to cover the EVA, which was amazing even though the EVA didn't completely run to plan. I hadn't realised how youthful some of the regular presenters are, I generally assume that they must be older than me because they know so much more than me (generally they're all professors or have doctorates or both). But they had a closeup of Chris Lintott and he looked very youthful, so I Googled him and he's only 35. But to balance this out, John Bishop is older than I thought he was, must be his sports career (he's a former semi-pro football player) keeping him looking younger. He was so fabulous at the astronaut training, and it was great to see Andreas Mogensen on TV too. But it was so cool to see Tim Peake out on the EVA, and it was great to follow all the news coverage and Twitter coverage, and the comments about him being the first under the British flag to conduct an EVA. I didn't find out about the terminate call until I got home and switched my phone on, and then I had stuff I had to do before I could get my laptop out. The detail of the issue showed it wasn't as critical an issue as when Luca Parmitano got water in his helmet a couple of years ago, but it was the right thing to do to terminate the EVA. Hopefully we'll get to see more of Tim's mission, there's still five months to go. Ten years ago today I followed many of my friends on the Devoted to Hugh messageboards and set up my LiveJournal. The first post was short and sweet. I don't post very often these days but I'm glad I still come back occasionally, sometimes a longer post is required and it's nice to have somewhere quieter to retreat to. So, 2016: the Road to Rio 2016 is already well-worn yet there's some distance still to go. Hoping for a decent defence of gold medals won at the Home Games, even though many have retired and many more will no doubt do so after Rio. It's likely to be a closer call in terms of the GB-Australia rivalry though. Space: I notice Tim Peake looks well settled in on the ISS, his somersaults and flips are more controlled, which is a good indication he's used to moving around in microgravity. A crew swap in March will see the ending of the Year Long Mission, and the end of 2016 will see the launch of Thomas Pesquet, the last of the ESA Class of 2009 to go into space. Work: Don't want to think about it. There's a reason we eat lots of cake and biscuits in our industry. One work-related highlight expected is a workfriend is to become a first-time Dad in the spring. Home: I discovered this Christmas how much I prefer my own home-made versions of goodies to the shop-bought stuff. So in order to get them right for next Christmas I need to practice during the year. A friend gave me an afternoon tea recipe calendar for Christmas so I might try some things from that if I'm in the mood to make something new. Also, I am hoping I can actually grow some flowers this year instead of crabgrass. Screen stuff: Certain articles are hinting that Peter Capaldi is about to give notice on his tenure as the Doctor. I think he's right not to stay too long but he's the best Doctor ever and I don't want him to go.